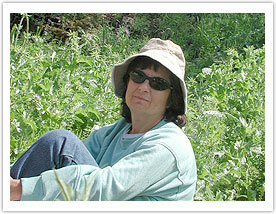 The Gesher Benot Ya`akov expedition regrets to announce the untimely passing of Dr. Shoshana Ashkenazi on 6 April 2010. She was a most valued member of our team who will be greatly missed. Dr. Shoshana Ashkenazi - Academic background in biology and ecosystems ecology, with experience in field research and conservation management of diverse ecosystems of fauna and flora in Israel. The main field of interest is wetlands and their conservation and management, with emphasis on their avifauna. Studies have been carried out in the Hula Valley wetlands and in Alaska, South Africa and Shetland. Since 2002 involvement in study of prehistoric sites in the Hula and Jordan Valleys, particularly GBY, with emphasis on their invertebrate fauna (crustaceans and mollusks) and elements indicating climate change. Ashkenazi, S. and U. N. Safriel. 1979. Breeding cycle and behaviour of Semipalmated Sandpiper, Calidris pusilla at Barrow Alaska. Auk 96:56-67. Ashkenazi, S. and U. N. Safriel. 1979. Time-energy budget of the Semipalmated Sandpiper, Calidris pusilla at Barrow, Alaska. Ecology 60:783-799. Lavee, D. and S. Ashkenazi. 1986/1987. Rate of resighting tagged males and females of Sandgrouses. Israel Journal of Zoology 34:100. Ashkenazi, S. 1993. Dark-morph Egretta spp. in Israel. Colonial Waterbirds 16: 202-207. Ashkenazi, S. 1994. Gene Bank for germplasm - conservation of plant genetic resources. Ecology and Environment 2: 77-84. (In Hebrew, English summary). Ashkenazi, S. 1995. Acacia trees in the Negev and the Arava, Israel - a review following reported large-scale mortality. Hakeren Hakayemet LeIsrael. 155 p. (In Hebrew with a summary chapter in English). Yom-Tov, Y., Ashkenazi, S. and Weiner, O. 1995. Cattle predation by the Golden Jackal Canis aureus in the Golan Heights, Israel. Biological Conservation 73: 19-22. Ashkenazi, S. 1996. Biosphere Reserves - The concept, their value in nature conservation and their function. Ecology and Environment 3: 207-217. (In Hebrew, English summary). Ashkenazi, S. and Y. Yom-Tov. 1996. Herons and fish farming in the Huleh Valley Israel - A matter of conflict or mutual benefit? Colonial Waterbirds 19 (Special publication 1): 143-151. Ashkenazi, S. and Y. Yom-Tov. 1997. The breeding biology of the Black-crowned Night-heron (Nycticorax nycticorax) and the Little Egret (Egretta garzetta) at the Huleh Nature Reserve, Israel. Journal of Zoology, London 242: 623-641. Ashkenazi, S. and Dimentman, Ch. 1998. Foraging, nesting and roosting habitats of the avian fauna of the Agmon wetland, northern Israel. Wetlands Ecology and Management 6: 169-187. Ashkenazi, S., Markel, D. and Kaplan, D. 1999. The catastrophic decline of cattail Typha domingensis in lake Agmon. Journal of Mediterranean Ecology 2: 1-17. Ashkenazi, S. 2001. Long-term trends in the breeding populations of waterbirds (1951-1985) in a sewage treatment plant. Ostrich 72: 10-19. Ashkenazi, S. 2004. Wetland Drainage in the Levant (Lake Hula, Amik Gölü and el-Azraq Oasis): Impact on Avian Fauna. In: Goren-Inbar, N. & Speth, J.D. (eds. ), Human Paleoecology in the Levantine Corrior. Oxbow, Oxford, pp. 167-190. Ashkenazi, S., Motro, U., Goren-Inbar, N., Biton, R. and Rabinovich, R. 2005. New morphometric parameters for assessment of body size in the fossil freshwater crab assemblage from the Acheulian site of Gesher Benot Ya'aqov, Israel. Journal of Archaeological Science 32: 675-689. Project - A Program common to all the Biological Collections. Haasiana, A Newsletter of the Biological Collections of the Hebrew University 3: 6-11. Horwitz, L.K. and Ashkenazi, S. 2006. The fauna. In: Y. Garfinkel and D. Dag (eds. ), Gesher: A PPNA Site in the Central Jordan Valley, Israel. Berlin: Ex Oriente, pp. 159-173. Mienis, H. and Ashkenazi, S. 2006. Remains of egg capsules from Theodoxus on 780,000 and 14,000 year old shells from Gesher Benot Ya'aqov . Haasiana, A Newsletter of the Biological Collections of the Hebrew University 3: 70-71. Ashkenazi, S., Huertas, A.D. and Spiro, B. 2007. The population of freshwater crabs from the Natufian deposits of Eynan (Ain Mallaha) – possible human effects. In: F.R. Valla et al. Les fouilles de Ain Mallaha (Eynan) de 2003 á 2005: Quatrième rapport préliminaire. Mitekufat Haeven, Journal of the Israel Prehistoric Society 37: 135-383. Betuhim-El, T., Ashkenazi, S. and Por, F.D. (in Press). The data base and collections of DCPE (Data Collecting Program Eilat,1974-1977) an available baseline for monitoring the changes in the Gulf of Aqaba-Eilat. In: F.D. Por (Ed. ), Aqaba-Eilat, the Improbable Gulf. Environment, Biodiversity and Preservation. Magness Press.